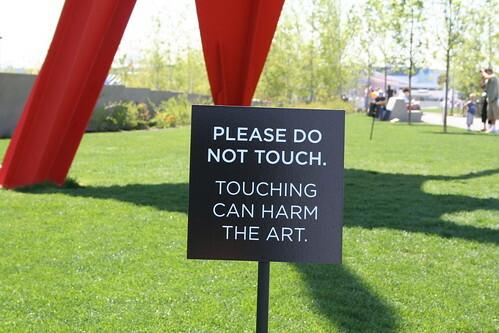 Seattle has the only outdoor sculpture park in America where you are forbidden to touch the sculptures. Which is odd, because some of them are designed to be touched. If a sculpture is designed to rust and degrade over time, isn’t it possible that letting people touch it might actually improve it? Isn’t art that reacts to its environment supposed to be in that environment? I thought the sign in the picture was very telling.